Federal's American Eagle line is aimed towards high volume shooters and finds itself used for classes, matches, plinking, and general purpose training at both indoor and outdoor ranges. 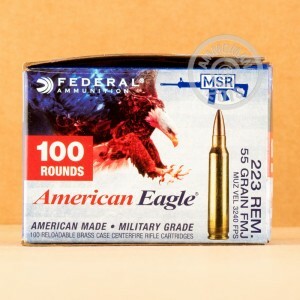 These .223 Remington rounds are perfect for your AR-15, SCAR, Mini-14, or other .223/5.56x45mm chambered rifles. Their relatively lower pressure makes them safe to use in all types of actions and barrels of this caliber. The full metal jacket bullets weigh in at 55 grains which offers lighter recoil and stabilizes easily with any of the most popular barrel twists (1:7, 1:8,1:9, 1:12). The casings are made of brass and are reloadable. Federal uses reliably igniting Boxer primers and the American Eagle line is known among shooters for its medium pressure load which cycles well in all gas lengths of AR pattern rifles. This bulk case contains five 100 round packs so you can open as little or as much as you need. 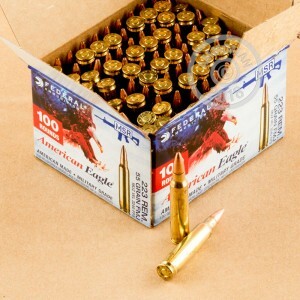 Buying in bulk not only nets you high quality ammo at a great price but ships free from AmmoMan.com. Great ammo and customer service even better!! So far great ammo,shot out of my AR15 and minnie 14.
great ammo, american eagle,.223 fmj. super fast shipping, best price have recommend to a friend at work, told me this am. he ordered 1000 round's , i will buy more, thank you ammo man!! Got the order in three days but it was over a week-end. I have been firing twice a week 60-80 rounds each time and no problems. Bang, bang, bang, bang, bang. Hold...squeeze...bang...hit...reload. The Federal ammo is more reliable than the govt. I have used this brand before and never had a problem. This brand is excellent.Never had a misfire or problem..
Great quality brass rounds, shot excellent and had no issues with any of the rounds after 450.
not a single issue with this ammo as usual federal is great.